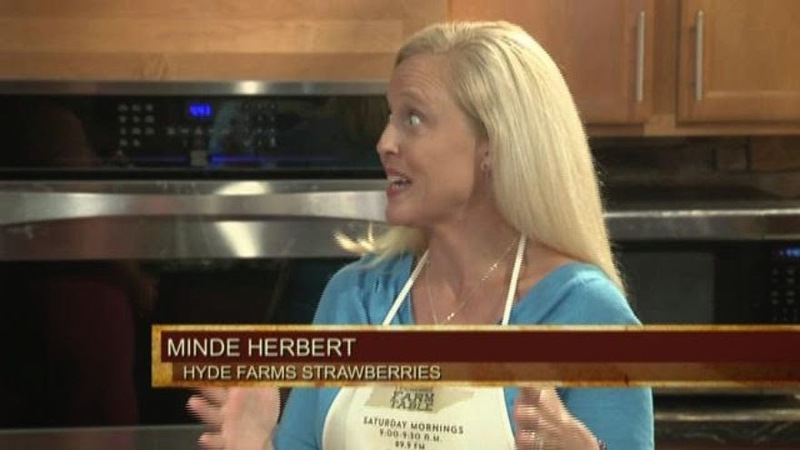 Tune in to The Tennessee Farm Table tomorrow at 9 a.m. on WDVX to hear me talk about all things corn. 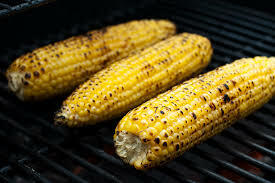 (What food is more synonymous with summer than freshly picked corn on the cob?!) You'll learn what to look for at the market, why picking quality GMO-free corn is important and more. If you can't listen in real time, find the broadcast on the On Demand section os WDVX's site and listen whenever you like. In the broadcast I include a couple of tasty recipes that show off corn’s versatility -- I've listed them below. Enjoy! Combine all veggies in large bowl. Mix all other ingredients in small bowl then add to veggie mix. -Shuck corn and remove silk. -Coat lightly with olive oil or grapeseed oil and sprinkle liberally with kosher salt. -Place directly over heat on medium-hot grill. -Rotate when dark spots appear and kernels deepen in color- usually about 2 to 3 minutes. -Turn occasionally for the next 8-10, until fully cooked. The ear will be speckled with char spots. They're popping up all over the place now and so prices are kind to your wallet, plus they are so, so good for you. 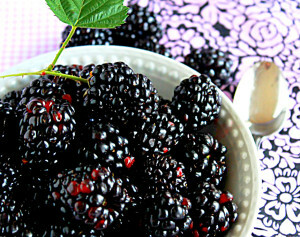 Did you know that blackberries are an excellent source of vitamin-C, which is a powerful antioxidant? Blackberries are low in calories, carbohydrates and have no fat, which makes them popular in low carb and low calorie diets. They also have good amounts of vitamin A, vitamin E, and vitamin K. Minerals like potassium, manganese, copper, and magnesium are in blackberries too. That's a lot of good stuff. Toss blackberries with lemon juice, honey and cornstarch/arrowroot powder and spread in a greased 8-or-9-inch pan. Combine brown sugar, butter, rolled oats, flour, pecans, cinnamon, and a dash of salt in a food processor; pulse a few times. 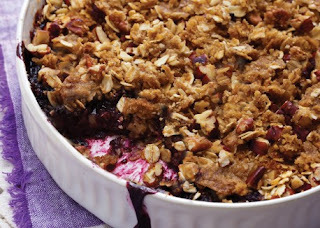 Crumble over fruit and bake at 375 for 40 to 45 minutes. This will keep in the fridge for a few days and also freezes really well. Do you have a favorite healthy blackberry recipe? I'd love to hear about it. Please feel free to post in the comments! Fair warning: There’s a bee in my bonnet. I’ve got a bone to pick. My dander is UP. Why? THIS. Apparently, some folks believe that home-cooked meals are a terrible burden and more trouble than they’re worth. Which, in my humble opinion, is big, fat load of malarkey. I’m not looking to make any enemies here but I think that statement is spot-on. -We know that our best conversations usually happen during a meal. Not the kind that’s eaten out of a bag in the backseat of a car, but the kind where folks are sitting together, gathered around table. -We know that when we get together to break bread our ties are strengthened. -We know that the act of preparing food for family (and friends) is an act of love. -We know that “fancy” is not always necessary and that simple meals are sometimes the best. -We know that one of the best and most immediate way to provide comfort to someone (aside from a hug) is to make them a meal. 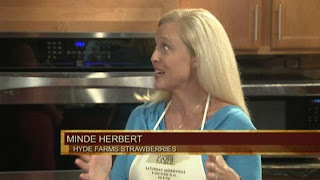 -We know that the kitchen is the center of the home for good reason. That’s where all the important stuff happens. We believe that the dinner table is the altar of the home, a place to reconnect, reenergize, and debrief with one another. The conversations at the dinner table help us grow as individuals and galvanize us as a family. I'd love to hear about the importance of home-cooked meals and your family... Please comment! Some corporations just get it. 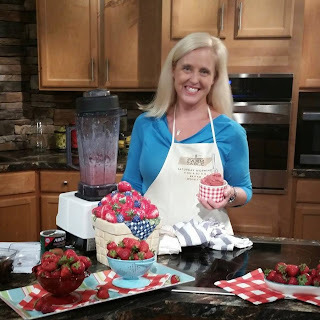 They are connecting the dots that good health is paramount to living a full life and they are taking steps to bring that message to their employees. Clayton Homes is one such company. I'm honored to present to their company today and to bring the gospel that everyone can eat well on a budget. Thanks, Clayton! I have some awesomely tasty classes coming up at the University of Tennessee's Culinary Institute this September, October and November. Stop buying and start making your fave foods. I hope you will join me! Homemade Condiments - Sept. 18 - 6 - 8 p.m.
We will create your favorite condiments from scratch -- for a fraction of the cost! Homemade equivalents of expensive ready-made items (without the sugar, fat, and mystery ingredients) can help anyone eat well on a budget. Learn how to make your own delicious fermented ketchup, chipotle mayonnaise, whole-grain mustard, and the "rooster" hot sauce, Sriracha. Everyone will take home a jar of each to enjoy! Maximum: 16 students. Fall Harvest Dinner - October 23 - 6-8 p.m. Eating wholesome, seasonal food is a great way to stay healthy and be kind to your budget. You'll create a delicious and easy seasonal dinner with the bounty of local harvests, plus learn how to develop creative meal plans; healthy, low-cost substitutions; the best way to identify good (and bad) grocery deals; useful tips on where to spend your "organic dollars," and much more. On the Menu: Butter Lettuce Wraps stuffed with Roasted Quinoa, Sautéed Local Mushrooms, and Seasonal Vegetables; topped with a dollop of Garlic Hummus, Fresh Pasta with Basil-Toasted Walnut Pesto, and Rustic Apple Tart with Honey Yogurt. Maximum: 16 students. Pizza Perfection - November 14 - 6-8 p.m.
Pizza lovers unite! You'll never call for delivery again after learning how to make your own delicious and low-cost pizzas. In this hands-on course, you'll create an easy and quick, fool-proof dough; learn tips for shaping and assembling your perfect pie; prepare a variety of toppings that will please the entire family, plus we'll show you some tips on how to bake your masterpiece without all that fancy restaurant equipment. You'll also prepare a classic salad and a favorite Italian sweet to round out the meal. On the Menu: Traditional Neapolitan-style Crust Pizza with two sauces -- Toasted Pine Nut and Basil Pesto and Rustic Marinara Sauce (plus four additional toppings), Classic Caesar salad with Roasted Garlic Herb Croutons, and Bittersweet Chocolate-Chip Biscotti. Maximum: 14 students. When you discover the ease of this recipe you will hesitate to buy store-bought yogurt again. Once you taste it, you will NEVER buy store-bought yogurt again. It's that easy. It's that good. This yogurt is tangy and tasty. It's the consistency of a European-style yogurt (a tad thinner than most store-bought brands) but you can strain it to get a firmer product. And then there's the savings: 32 oz. 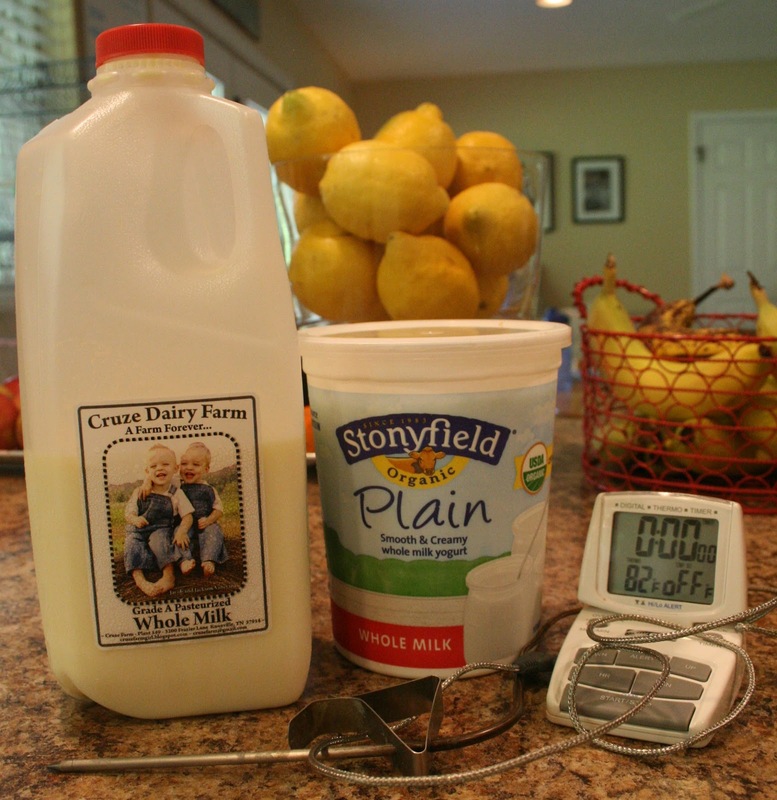 of organic, plain yogurt typically runs about $7. (+ tax) in the local mart. Since it's a big part of our diet we were spending about $30./month for yogurt. We use it as a fat in baking, we stir it into applesauce, use a dollop in smoothies and much more. Now I spend about $3./week or $12./month.That's a savings of nearly $220./year! ON YOGURT. 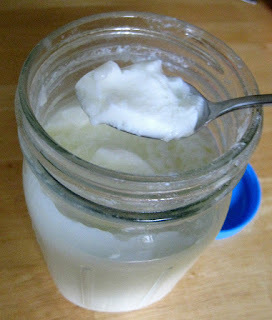 Besides, it's kind of fun to tell folks, "Yeah, I make my own yogurt." In a stockpot, heat milk gently on medium heat, stirring approximately every 10 minutes, until milk is close to a boil – about 180°F. If a skin forms, remove it. Remove one cup of warmed milk and add yogurt starter (live yogurt) to it. Whisk gently, then add milk and starter back into pot. 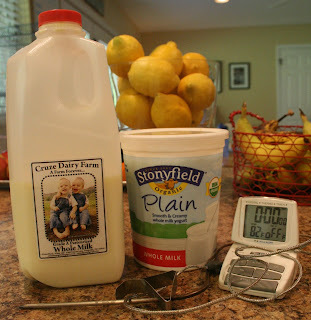 Pour milk into glass container. (I use a Pyrex bowl with a plastic lid or sometimes quart-sized or pint-sized Mason jars with lids and seals.) Cover. 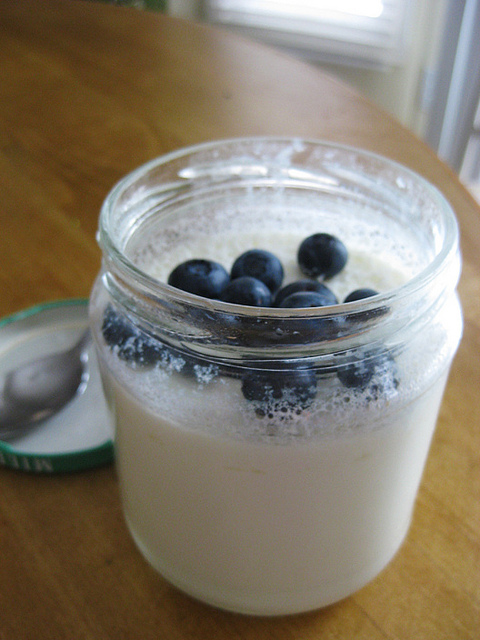 After 12 hours, remove yogurt from oven and whisk gently to desired, creamy consistency. Chill 4-6 hours for additional firmness. For extra firm yogurt strain through a *very* fine mesh strainer (also called a chinois strainer) or through several layers of cheesecloth or even a t-shirt. Finished yogurt will keep for 1-2 weeks in refrigerator. Quick tip: You can use your own yogurt as a starter the next time you make this recipe! Bonus! 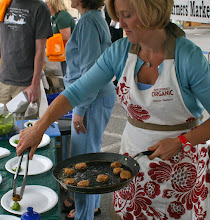 I'm a passionate advocate for real, whole foods and teach others how to eat well and organically on a budget.